All I can think of when I see this product is that Iggy Pop track from a few years back: Gardenia. I realize it's not exactly the same word, but it's close enough that I get that bizarre, oddly-catchy chorus stuck in my head. "Bizarre and oddly-catchy" wouldn't be entirely inaccurate if you were describing these veggies. Although the word "giardiniera" is foreign to me, the concept of spicy, pickled vegetables is not—peppers and carrots in particular. Sonia introduced me to the Mexican version—the La Morena brand—fairly early on in our relationship, and I fell in love with them. 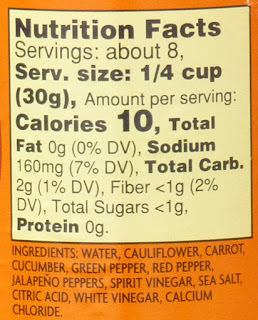 They're advertised simply as "pickled jalapeno peppers," but the small can contains carrot slices and onions, as well. La Morena has much more flavor and heat than this Trader Joe's product, but that's not necessarily a bad thing. Things like pizza and pasta don't always beg for mouth-searing spiciness in the same way that many Mexican dishes do. That's when these pickled veggies come in handy. They'll spruce up just about any Italian dish that needs a little extra color and flavor—and even most American dishes for that matter. The veggies are surprisingly crisp and crunchy considering they've been floating in liquid for a good while. The green and red peppers are noticeably limper than fresh specimens. It's the carrots, cauliflower, and pickles that flaunt an unexpected crispness. Some of the cauliflower pieces were large whole florets. I wouldn't have minded them in tinier fragments. 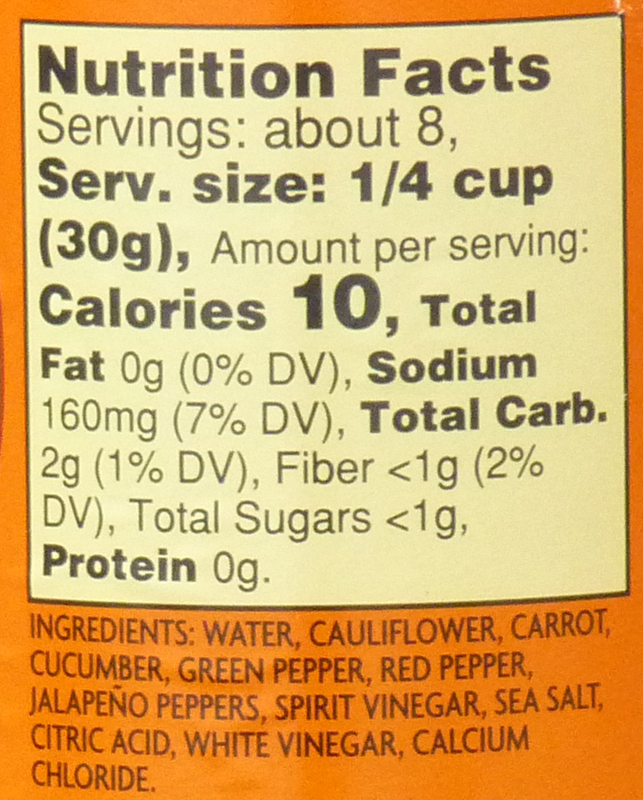 The liquid is predictably briny, but there's a pretty decent balance of the pickled flavor and natural veggie taste. For $1.99, this product makes a nice handy sprucer-upper to have on standby. I probably wouldn't recommend them as a stand-alone snack, although, I guess there are plenty of people who eat pickles that way, and well, there are pickles in here—pickled cucumbers, anyway. 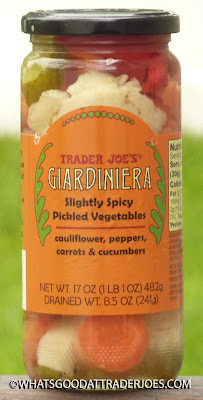 So if you'd like to expand your pickled veggie horizons, you should totally check out this jar of giardiniera. P.S. - Where are you, Giotto? no no no no no no no. -one million out of 10. So bland. As a Chicago resident, where Giardiniera is a way of life, this was deeply disappointing. Also a Chicago resident here and a TJ’s employee. 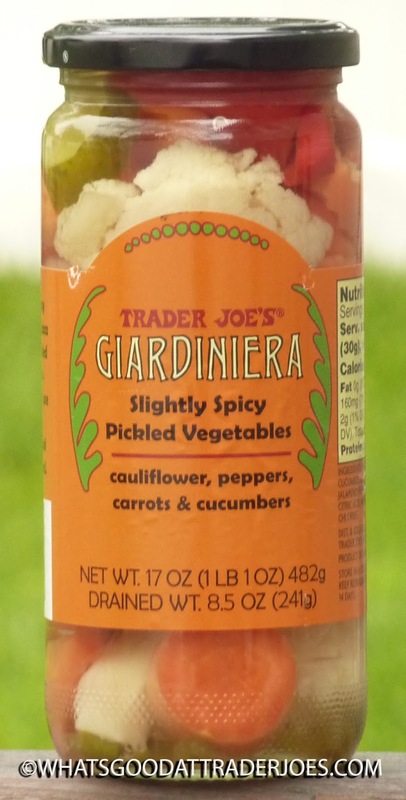 I was excited when I first heard TJ’s was going to bring Giardiniera to the masses. Then when THIS happened, I was severely disappointed. Decent product? Yeah, I guess. Giardiniera? Absolutely 100% not. So very bland. I’ll stick to the good stuff I purchase at World Market.